"Indigestion" is an interactive video installation in which we explored what is at stake for the conventions of subjectivity in the presumption of choice. (This project was made possible with the help of the Banff Centre for the Arts.) 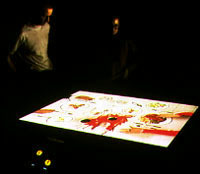 Two dinner companions are projected from above onto a horizontal screen which corresponds precisely to a life-size table and hovers at table height. The familiarity and full-scale nature of the scene, its liveness, is critical to the sense of transgression that the piece sets up: when you walk into the installation, you walk into a private conversation, the course of which you can re-direct. A touch screen offers a menu of diverse characters from which to select, each a sexual and class stereotype. The characters are of ambiguous relation and are only defined by their hands -- their accouterments, their gestures, their ticks, and their voices. The voices were directed by Marianne Weems. The viewer is asked to choose two characters to activate the piece and then given the option to change characters throughout the course of the meal. Any replacement of a character triggers a branching pathway in the narrative, which is introduced by one of 106 animations which resets the table. An archetypal blackmail scenario is disguised in a repartee about food. The dialogue, written by Douglas Cooper, is conceived for continuity in any branching pattern. But as each new juxtaposition alters the event in accordance with the chosen stereotype, the content remains strikingly similar. As in classic noire, there is always a fatal deception of the masculine by the feminine.